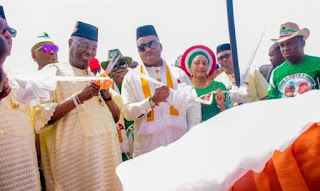 The Presidential candidate of the Peoples Democratic Party, PDP, Atiku Abubakar has professed his love for the people of Akwa Ibom. However, as a practical demonstration of his love, Atiku promised to build a refinery in the state if elected as president even as he accused the ruling All Progressives Congress, APC, of bringing hardship on Nigerians. He said: “When APC was coming in 2015 they said they were going to improve on our economy. Today we have the highest rate of unemployment in the history of our country. Today the United Nations has declared Nigeria the headquarters of poverty in the world. “They said they were coming to improve insecurity. When they came, there was insecurity only in the North east. Today, they didn’t control the North east insecurity problem; there is insecurity in the North west, there is insecurity in the North central. If you don’t stop them, insecurity will come to Akwa Ibom, it will come to the South south.